Fogartyville invites adults for artistic fun in a relaxed social setting, which includes snacks, refreshments, and beer & wine. This is a great opportunity for friends to hang out, a unique date night option, or a place to come solo and connect with fellow art enthusiasts. Each session is led by a different. No experience required. $20 cost per session includes materials necessary to make art project, snacks and one drink ticket. Deb Serbousek fell in love with creating handwoven fabric. Her mother’s 4 harness Harrisville loom may have had something to do with it. She has a background in costume design (Master’s of Fine Arts, University of Maryland) and a passion for teaching and sharing. 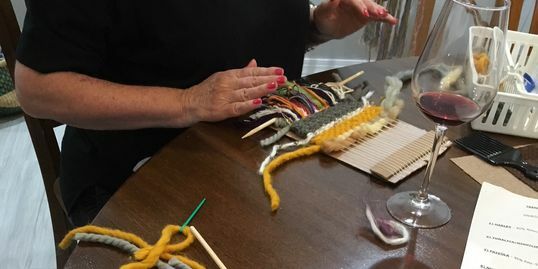 For “Make Art Happy Hour”, Deb will introduce twining, a technique used to make rag rugs. Deb’s “Make Art” project will use a smaller version of a twining loom to create a “mug rug”. Participants should bring a T-shirt (any size) to upcycle as a “mug rug”. All other necessary supplies will be provided.